You might have heard the old saying: “Failing to plan is planning to fail.” While it’s a humorous play on words with good intentions, it still may make you feel a little uneasy. A large part of what we do here at the Academy is coach our Members on effective planning that will lead to achieving short and long-term goals. 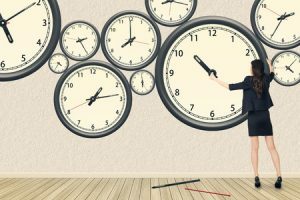 A common road block we see many of our Members encounter is wrestling with time management and often feeling like there is not enough of it. While we all wish we could have two (or four or ten) hours to the day to get everything done we need to, unfortunately there’s no magic bullet to do that. We all only get 24 hours each day – only about 16 of which you should be awake and active for (yes, sleep is essential to your success) – so your success lies in what you do with those hours. The most successful people in the world didn’t have the luxury of extra hours in the day to achieve their wild success. But what they did have was a team who supported them, a diehard passion to succeed, and a good handle on managing the hours in each day. Consider this: the human mind processes an estimated 70,000 thoughts each day. Merely thinking about how much time we spend thinking about things (now you’re thinking about what you think about, eh?) might make your head spin. The key to your success is to not let the idea of time management and passing thoughts get in the way of making progress. I don’t just mean that place in your mind where you’re disconnected from everything else around you. That’s what we call daydreaming. What I’m talking about is an actual location where you can go and feel uninterrupted and at peace. Schedule several hours in this place where you can be alone and ensure your productivity. Take in your surroundings and be ok just sitting with your thoughts at first. Pausing and deliberately taking time to plan will make a world of difference. Even though you’ve found your happy place, the thoughts racing in your mind still need a solid place to land. Whether it’s putting ink to paper or fingers to keyboard, the next step is to take as many of those 70,000 thoughts per day – especially the recurring ones – from your brain to somewhere tangible. Materializing ideas and goals gives you control over them and allows you to bring them to life where they are more tangible and manageable. Identify the routines or habits you have that get in the way of taking actionable steps toward achieving your goals. Do you frequently set calendar reminders but constantly hit snooze or ignore? Especially on those appointments that are scheduled for time just with yourself and your productivity? Do you allow other team members’ emergency situations to interrupt the flow of your own work? What works for someone else to keep them on track and remain in integrity with the calendar they have set might not work for you. That’s why there are so many different approaches and tools to employ to help keep you on track. Try different approaches until you find what works best. But beware: don’t try something new just because it’s something shiny and new. Find what works and stick to it. 4. Use The Tools At Your Disposal. Identify how you learn best. Are you a visual, auditory, or hands-on learner? Whatever your best learning style, find tools to use that match your style. Reminders on sticky notes, using a note taking software, a recording device for your thoughts, an app on your smart phone, a whiteboard in the office… the possibilities are endless and you may need to employ more than one. Identify the combination that works best for you. And then buy a lifetime supply of sticky notes (if that’s your jam) so you’re never without them. After you’ve spent all this time and energy identifying the best practices you need to implement to move the needle on productivity and success, stick to that system like shoelaces on Velcro! As I mentioned before, don’t allow yourself to get distracted by the newest, highest tech app someone else is using just because they rave about how great it works. Know what works for you and stay the course. If you do find a strategy or an app that you think may improve your time management, don’t throw out everything you know that works to put something else in place. Use new things in cooperation with your existing system until you know how they will truly work for you – or not work. You’re working hard toward getting a handle on your time management – be sure to reward yourself when you’ve completed a particularly slippery goal you’ve been trying to achieve for a while – you deserve it! Treat yourself to a relaxing massage or another half hour of golf. And most importantly, every so often remember to stop and look back at how much you’ve accomplished.